I popped up to the Cycle Show at the NEC in Birmingham a couple of weeks ago. It's always good to see what the latest novelties are as well as catching up with cycling trade and media bods. As ever, this event comes up at a time that is sandwiched between other important things I need to get done, so my trip ends up being a real whistle-stop tour that leaves me out of breath and with a head so crammed full of things that I can't really piece together what I actually did and who I saw! 1. 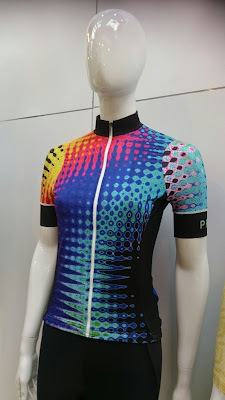 I really like the Primal jerseys with their eye-catching designs and zany colours. They always manage to get the balance right between pushing the boundaries in colour and design while still keeping everything tasteful. I also feel confident that the flashy styles of the Primal tops make me less likely to become victim of a SMIDSY (Sorry mate I didn't see you) incident with a motorist while out on the road! 2. The Condor Cycles Fratello steel all-round touring/winter training is the signature bike from the this institution on Grays Inn Road, though I have not got round to riding one yet. I like the vintage design on these Italian-manufactured bikes. 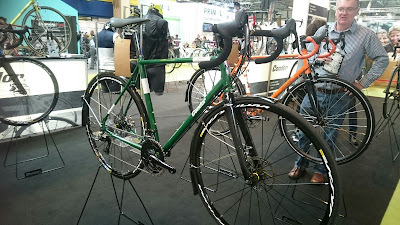 But shock horror, vintage has been splashed with the modern phenomenon of disc brakes and some designs also have internally routed cables - damn (or Porca Miseria might they say in Italy)! Okay, I take it back - I like harking back to nostalgia provided the components aren't too historic. I've seen those pictures of folks riding the Eroica cyclosportive in Italy, having to drag their 30-year old bikes over those unmade "strade bianche" roads, and the misery of dealing with brakes that wear away in no time when challenged. 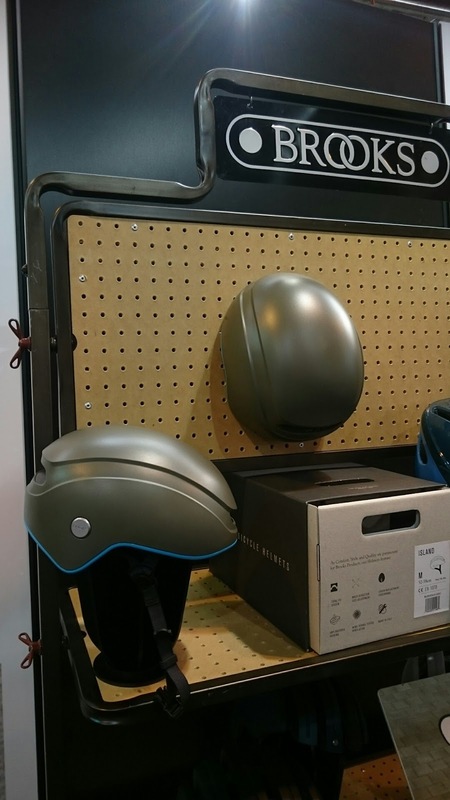 So hey, a bit of disc doesn't do any harm particularly if it makes your bike ride comfortable. In any case, the brakes are not the most prominent aspect of the bike. A jolly good job has been made on the paintwork and the colour scheme hits the exact part of my brain that gives me a feelgood factor. So yes, I can live with a bit of modernity on a vintage design bike! 3. I have ridden the Tweed Run a couple of times and whenever I do so, I always come away thinking "I should wear this tweed gear more often when I commute around London." It's so elegant and reminds me of being in the era of "Call the midwife" or "EM Forster". I guess when riding I would turn a blind eye to the traffic jams, cycle couriers and tourists! I envisage myself riding the Fratello (notwithstanding the disc brakes) wearing corduroy trousers tucked into my socks with a tweed jacket and a Brooks helmet. This formal style helmet is something that I could wear with a variety of outfits - trousers or skirts. In fact I think the readers of The Lady magazine may well approve of this type of attire, though I guess they would just have to not pick up this helmet by mistake when going out for their afternoon horseriding hack after doing lunch! 4. I have never ridden an ebike of any shape or form before, but I couldn't resist the opportunity to try this out this Cube eMountain bike. 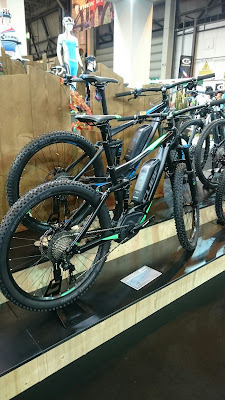 The rep described the bikes as being for those who are of a certain age or who have dodgy knees/backs but want to keep up with their mates effortlessly while out on the trails. Well yes, I have been taking it easy since I strained my back a couple of weeks ago, and I am no spring chicken. So I ticked all the boxes! Riding the bike felt quite weird because you didn't have to pedal much before the bike accelerated really quickly. In fact the biggest trick of the bike is to keep the thing under control when it suddenly gains speed that you weren't expecting - particularly on berms or zig zags! I had a few near misses, and really thought I was going to be that person who would stack it on the test track in front of all the visiting spectators! Luckily I held it together. The eMountain bike is not bad. I just wonder how you cope if the battery runs out, or if you have to lift the thing over obstacles while out on the trails. Then something that was supposed to help your dodgy back could end up breaking your back! They are a good idea in principle, and a great novelty. But I would probably be happiest riding them on hilly trails that aren't too technical such as those on the South Downs Way. If riding with mates I would still be happier just riding something conventional that will have fewer moving parts to worry about going wrong. It's one thing to have a puncture and your mates stand politely waiting for you while you sort it out. Some may even step in and help you if you're a bit slow or if your pump is not very efficient, and after all that you would have only lost about 10 minutes of riding time. But would anyone have a spare engine or battery pack on them if you had a mechanical with your ebike in the wilds of the Lake District? And how long would it take to sort that out? Well it would surely mean an abandoned ride, possibly with an emergency call-out to a significant other to get you home. I don't think you'd be too popular! Maybe I'm over-exaggerating, but that's the overcautious worst case scenario planner in me! It's the same reason why I don't like road bikes with electronic gears. Well, I'm sure these bikes have their place, and who knows? In the future the doubters may well be proved wrong. 5. Seems a bit strange to go all the way to a cycle show to buy biscuits! But yes, I admit it. I fell for the "three things for £3" deal being offered by Nairn's oatcakes. I always like a bit of oatcake in my daily diet. I usually have it with soup or salad at lunch time. It seems that the good people from Edinburgh have now decided to get into the sports market by extolling the virtues of their biscuits as a source of energy during endurance sport. Certainly muesli/porridge is great as a slow release energy source throughout the day. 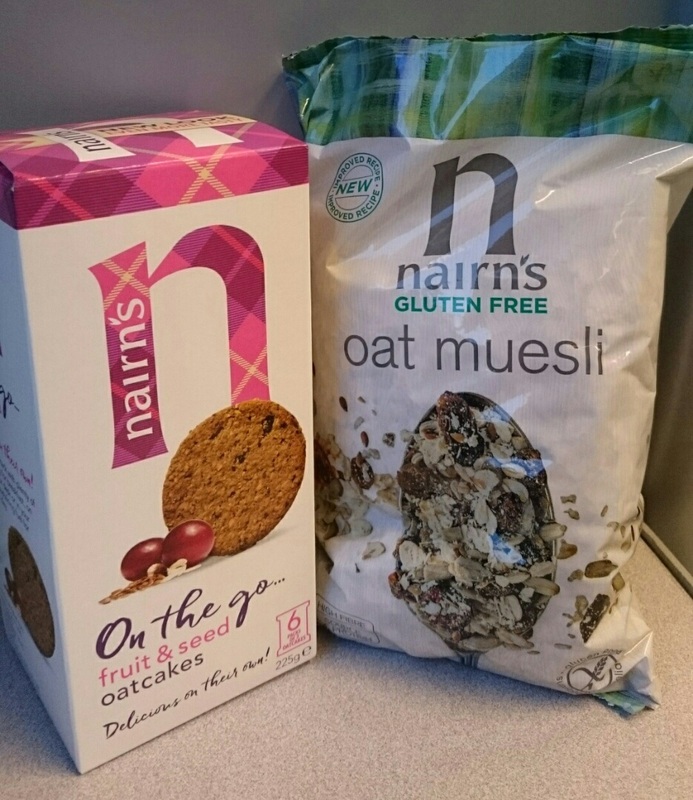 I do also like the fact that Nairns do individually wrapped savoury snacks that are easy to eat while on the move. I particularly liked their fruit and seed oatcakes as they taste slightly sweeter than the others. They may not be a replacement for the energy bars and drinks that we swear by during a long-distance cycle ride or a road race. But they fill the gap well when you just want some real food to eat while you are out, and they provide health benefits at the same time.